Thank you for joining us! When registering, you'll be ready for mobile bidding silent auction fun. The auction will be full of incredible packages that will all help to support ASK's mission of making life better for children with cancer in our community. If you have any questions, please contact the ASK office at 804-658-5910 or bnelson@askccf.org. When registering, you'll be ready for mobile bidding silent auction fun. The auction will be full of incredible packages that will all help to support ASK's mission of making life better for children with cancer in our community. If you have any questions, please contact the ASK office at 804-658-5910 or bnelson@askccf.org. When registering, you'll be ready for mobile bidding silent auction fun. The auction will be full of incredible packages that will all help to support ASK's mission of making life better for children with cancer in our community. If you have any questions, please contact the ASK office at 804-658-5910 or bnelson@askccf.org. $1,000 funds a day of psychosocial support services in clinic. Thank you for helping to Make Life Better for Children with Cancer! Be a part of the joy and fun in packing the Grand Ballroom with over 430 guests on the evening of Saturday, March 9, 2019 at the historic Jefferson Hotel. Cocktail attire and masquerade accessory is optional - but encouraged! The evening will include silent and live auctions, a seated dinner with wine service, cocktails and after-party featuring live music by The Jangling Reinharts. Together, we'll reach our goal of $435,000 to show our community's youngest cancer patients and their families that they can count on us. This year's auction includes amazing packages for the kids, home, travel, dining, VIP experiences, sports, and golf. Anyone can participate in the silent auction through our mobile bidding platform. Just click the register button at the top of this page to sign-up. Silent auction winners do not have to be present to win. The event sold-out in November; however, there are limited tickets becoming available. Please contact Britt Nelson, Development Director, at bnelson@askccf.org or 804-305-2836 if you are interested in purchasing. All tickets are $150/person and include cocktail reception, seated dinner, open bar and after party with live music by The Jangling Reinharts. 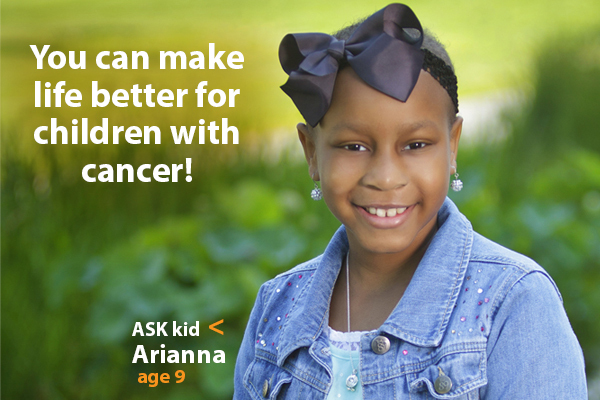 With 1-2 childhood cancer diagnoses per week in Central Virginia, the numbers add up quickly for families that need emotional, social, and financial care as they navigate the complex and stressful issues of cancer treatment. Your support will enable ASK to be there to provide something as big as financial assistance to pay their rent this month, or something as little as a snack, a toy, or a shoulder to cry on. Questions? Please contact Britt Nelson, Development Director.